There is an ancient method of smoking known as Dhumapana, which is actually an Ayurevdic Treatment known to clear the lungs of excess Kapha. The utilization of herbs such as bishop's weed, turmeric and cloves are said to be a good thing to inhale. But Ayurvedic smoking is different from modern day smoking. It is carried out for head and neck disorders as well as emotional disturbances and mental issues. Sometimes burning is done with a wick and patients inhale through nose and out through mouth. 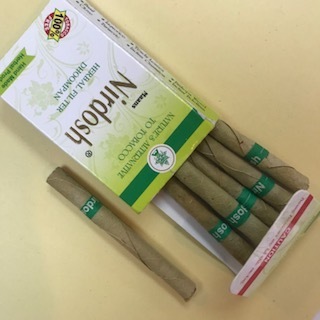 However, there its a product out there known as Nirdosh Herbal Filter Dhoompan (Hand made cigs that you can smoke to give up or kick the actual habit of smoking). I tested them and they taste herbal and like cow dung! But they've completely put me off smoking nicotine and tobacco. Mostly in our culture we hear of vaping noways to remove the side effects of smoking or burning herbs. There must be discretion for smoking though. Here at LTF, we are selling these herbal cigs if you want to quit smoking. Being an ex smoker myself I tried everything from acupuncture to hypnosis and all sorts. These really help with the habit, as mostly the breathing in and out is what is important.